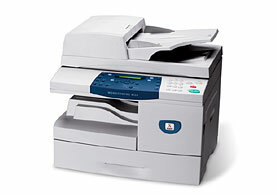 Black and white digital copier, network printer, color or black-and-white Fax and Scan to email. 22 pages per minute (letter). N-up prints multiple pages on a single sheet, saving paper. Create Booklet reduces the size of each page by 50% and prints two pages per side in 2-sided mode, saving paper and time. Toner saving mode to print all solid areas as a shade of gray instead of black saving toner consumption. Optical Character Recognition & Image Editing Software are included to convert scanned images into editable text documents. Push buttons gives you quick access to commonly used office features like 2-sided, Reduce/Enlarge, Collated, Lighter/Darker, Resolution and Color Originals. N-Up Printing enables printing of more than one page on a single sheet. One-up, two-up, or as many as 16-up printing on the same page. This environmentally friendly feature decreases the consumption of paper and toner. Fax forwarding to another fax or to email addresses. Poster printing feature automatically resizes your document so it prints across multiple sheets, which can be joined together to form a big poster. Booklet Printing reduces the size of each page by 50% and prints two pages per side. The pages are printed in the correct order so the document can be folded and stapled to form a booklet. Centreware Internet Services provides ability to remotely perform machine setups or check device status. Centreware Web, Centreware DP, Novell NDPS, HP Openview also available to allow remote administration and monitoring/reporting capabilities. 50-sheet Duplex Automatic Document Feeder, Scan-Once-Print-Many Electronic pre-collation. 550-sheet Feeder, Cabinet Stand, Foreign Device Interface.